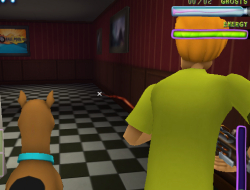 This is a Scooby Doo game in which you will play as Shaggy and Scoob because you know they never get separated, mostly because if any one of them were alone they would be really scared. This time Shaggy has a shotgun and you are exploring this old and creepy house which seems to be haunted. Search all the rooms for clues and who knows, maybe you can even find some Scooby Snacks. This is a shooting game and it is in 3D so you have to make sure that your aim is good or else some ghosts might frighten the two dummies. Use the mouse to aim and fire, WASD to walk. Haunted House 10.00 between 0 and 10 based on 2 votes.